Pjur Med Premium Glide 100ml is ideal for sensitive skin and does not contain any pore blocking ingredients. Only a few drops are needed. Ultra concentrated, super slippery, no smell, doesn't irritate in any way. Great stuff. 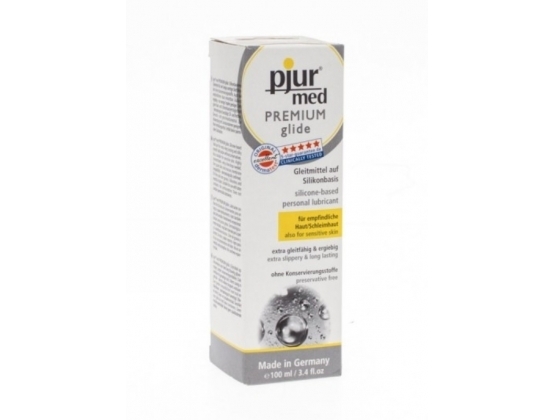 Pjur Med Premium Glide 100ml is ideal for sensitive skin and does not contain any pore blocking ingredients. Only a few drops are needed for that long-lasting lubrication you love. This product is condom and latex-safe. It is free from colour, perfumes, paraffin, preservatives, fats and oils. It is also great with toys! Try it today to experience the difference.